Charles Krauthammer entered to a standing ovation. The audience sat enthralled throughout his 90 minutes on stage and then gave him another standing ovation as he exited. Roughly 500 people gathered together Friday for the first evening of National Review Institute Summit to discuss the future of conservatism in America. Krauthammer, a nationally syndicated columnist and Fox News regular, discussed what Republican party’s past and future in a wide-ranging on-stage interview with current National Review editor—and onetime Krauthammer research assistant—Rich Lowry. "I’m happy to be anywhere where Juan Williams can’t interrupt me," Krauthammer quipped at the beginning of the interview. He took advantage of the less constrained, free-flowing format to expand on his ideas well beyond what he would have time for on television. When asked whether he thought America was in decline, he gave an extended historical analysis of America’s current situation. "We have been living since 1990-91 in an unprecedented situation," he said. All other great powers have had comparable rivals—imperial Britain, he noted, always had France and Germany close behind it. But after the Soviet Union fell, nobody approached America’s dominance. American superiority, he said, depended on two factors: keeping our domestic affairs in order, and maintaining the resolve to be active in the world. 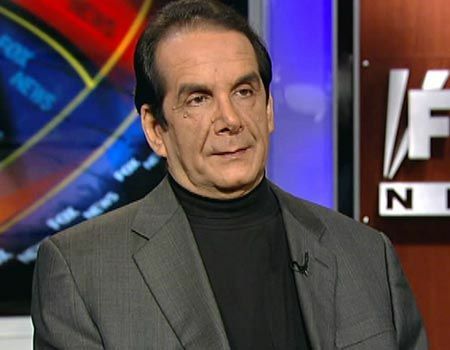 Krauthammer said that America’s vote for Barack Obama means that America has settled for decline. But, "I don’t think it’s a conscious decision," he said. Krauthammer praised the president on multiple fronts. "Obama ran a brilliant campaign. He created some issues out of nothing," Krauthammer said. However, he was saddened that presidential elections are so heavily influenced by personality. In contrast, "2010 was a purely ideological election." Reflecting on a dinner he had with the president-elect in 2008, Krauthammer said "He showed a very keen capacity to understand and to respect a contrary argument." His experience with Obama in 2008 gave him hope for the president’s tenure. That hope did not last long, Krauthammer said, to laughs from the audience. Krauthammer noted that the Republicans control one half of one third of the government, and he said that much of the Republicans’ agenda would involve blocking the president’s agenda. "Blocking is a virtue unto itself," he said. He did offer a little hope that Republicans could advance their agenda, if only incrementally. He said that the recent debt ceiling vote was a victory for the Republicans, because they forced the Democrats to produce a budget in the next few months—something they have not done in four years. The conversation ranged from Krauthammer’s intellectual journey, to the Republicans’ supposed demographic challenges, to the decline of the family structure, to the 2012 presidential campaign. Krauthammer barely paused after each question to gather his thoughts before firing off an extended answer. Both Krauthammer and Lowry repeatedly referenced Krauthammer’s work for Walter Mondale. Krauthammer’s excuse? He was young once, too. While he did not hide his displeasure with the president’s agenda, Krauthammer tried to be fair to his positions. When one audience member asked him about the president leading America on the "slippery slope to socialism," Krauthammer firmly said that socialism is too broad of a word to use for the president—social democrat is more accurate. He wanted to give the president the courtesy of acknowledging his true position—a courtesy, he noted, that the president does not give to his conservative rivals. Krauthammer’s interview followed two other on-stage discussions. First, Jay Nordlinger interviewed freshman Rep. Tom Cotton (R., Ark. ), followed by a discussion of the pro-life movement and its successes and challenges. The conference will continue through the weekend. This entry was posted in Politics and tagged Charles Krauthammer, Journalists, Media, National Review Institute. Bookmark the permalink.